As most folks may be aware I've been testing two news lens for the Cambo RS-1000 one of which is the Schneider 24mm XL along with a centerfilter. The purpose was for me to get used to the lens and learn of any quarks. I never really thought I'd get an image that went beyond nice to share on the web. That was till I open this image and processed it. The image is offered in 11x14 or 16x20 or larger. 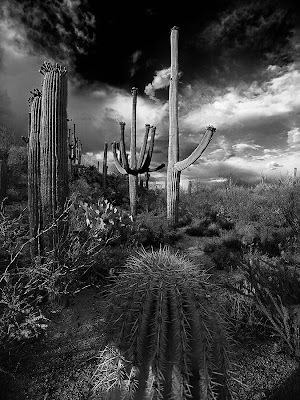 I initially called it "Stormy Saguaro" however the person who saw it this morning in the gallery nicknamed it "Gates of Hell" - then ordered a print. While there's a dark side to the image and the saguaros could be seen as either gate posts or signposts I'm a little uncertain of the "goth" name. A more detailed image is available on our website under "New Works" in the gallery section.